Tucked inside a small shopping center in the heart of Parkville, Mo's Fisherman's Exchange barely looks like it's still in business. From the outside, you will see a generic blue sign, a dirty exterior, and a small shadow box with a dingy, outdated menu inside. It's a shame, really, because once you get past the small, narrow "sports bar" area, and you find yourself in a nice dining room, you forget all about the crappy outdoor appearance. From the outside, it is deceiving, because on the inside, it's much bigger than it looks. Although the dining room isn't anything spectacular, it is somewhat pretty. White tablecloths, well-lit, nice open area, and two corner areas that are very semi-private. They could stand to get rid of a few tables and spread them out some, so you aren't sitting on top of your neighbor, but it seems that's how most older restaurants are. When it comes to appearance, Gordon Ramsey would have a field day with this place. When it comes to the food... I'm sure Gordon would also have a lot of complaining to do. But that's because he tends to be pretentious, and I'm sure he does most of it for the cameras. I, however, really enjoyed my meal. Thoroughly, actually. I started with a glass of the house Pinot Grigio, which was Luna di Luna, and very good. Although it came in a terribly small wine glass, filled to the rim, it was still a good wine. Our waiter (who also seated us) was very professional. After he poured us some water, he asked if we would like to hear the specials, and although I knew exactly what I went there for, I obliged. I was pleased with the fact that he included the prices while rattling them off, too. I hate when servers expect you to guess, or make you feel cheap when you ask. 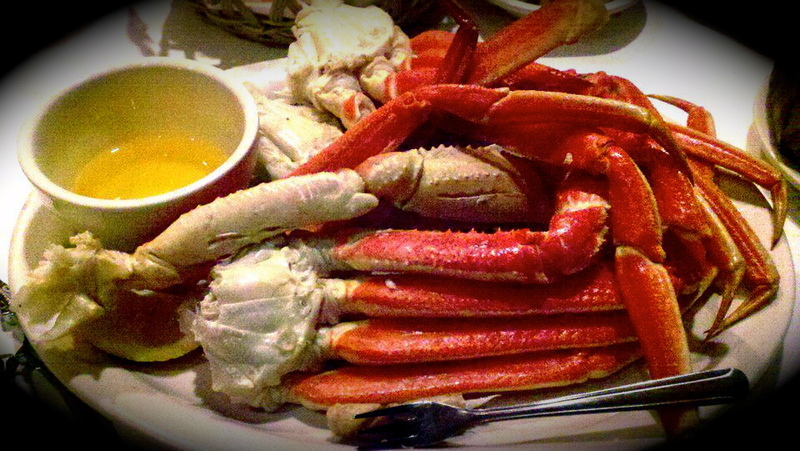 I ordered a pound of the steamed Snow Crab Legs. Served alongside drawn butter and lemon wedges, I was quite pleased with my plate. I am not sure whether it was because I was so incredibly excited, or because they truly were that good, but I had already decided right then and there that I would be making Mo's a regular spot to satisfy my crab leg cravings. Bucky had the Seafood Marinara, which came with mussels, crab, shrimp, and scallops in a marinara sauce over linguini pasta. I didn't try any, but he said it was good. Nothing spectacular, though. The mussels were smaller then any little neck clam I had ever seen, but all-in-all, he said it had a good flavor. Mo's ended up being a pretty great spot to eat. Local, and very close to our house, the restaurant, although "dingy" (and in very much need of an upgrade!) was just as good, if not better, than any in the area. It was also reasonably priced (go on restaurant.com for their $25 gift certificate). Our meal came to $72, minus the $25 from the gift certificate, Bucky ended up paying $61 total with tip. Not a bad night, at all!